MadgeTechs EGMS is specifically designed to measure and record the temperature and humidity of eggs during shipping, storage and incubation. 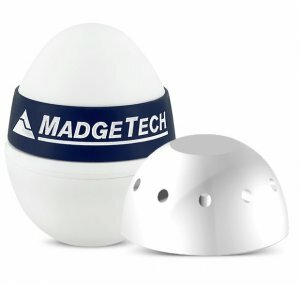 The data logger thermally responds to an environment the same way a real egg does, simulating the temperature and humidity experience of the actual product. The EGMS comes with a humidity and temperature cap, and a temperature only cap. The temperature and humidity cap has vents to measure the humidity, where as the temperature only cap doesn't have any vents, and makes the product submersible. The EGMS can measure temperatures up to 60°C. It has a user replaceable battery, that typically lasts up to 1 year. The nonvolatile memory can hold up to 32,767 readings and will retain data even if the battery becomes discharged. MadgeTechs data logger software offers an easy way to analyze data. Data can be viewed in Celsius or Fahrenheit, and in graph, summary or data formats. For further analysis data can also be exported to Excel.